Here’s the part where I make it up to you: I share a Domestic Rebel recipe perfect for Valentine’s Day. It’s a peanut butter cookie, with chocolate chips and Reese’s Peanut Butter Hearts. Some interesting things happened whilst I was shopping for ingredients to make these cookies, and yes, I just channeled my inner Shakespeare and busted out a “whilst” on you — love must be in the air. 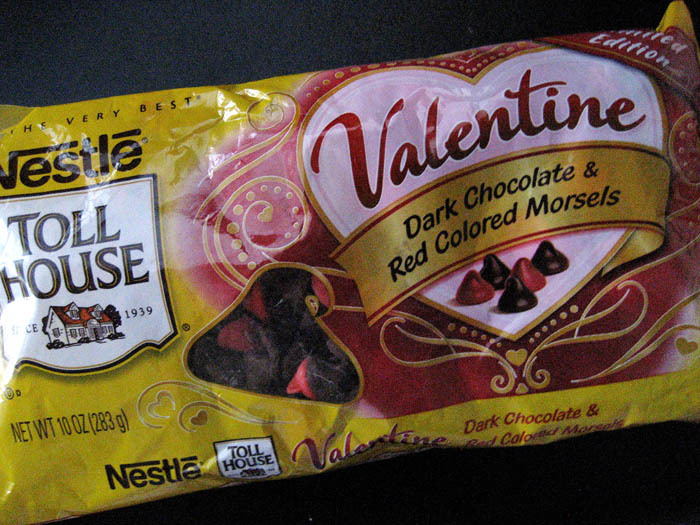 First of all, I found Nestle Valentine’s Semi Sweet Chocolate Chips. They’re regular semi-sweet chips mixed with red chips (a.k.a. white chocolate chips colored red). Duh! I didn’t hesitate grabbing these to use for my cookies. Next, whilst scanning the candy isle, I wondered whether a single bag of Reese’s Hearts would be enough for this recipe. It was then that I spied the caramel-filled Hershey Kisses. Now, normally I am opposed to Hershey Kisses — they’re wax, not chocolate — but I’m less opposed when they are filled with something, especially when the targets of these cookies I know are fiends for caramel. 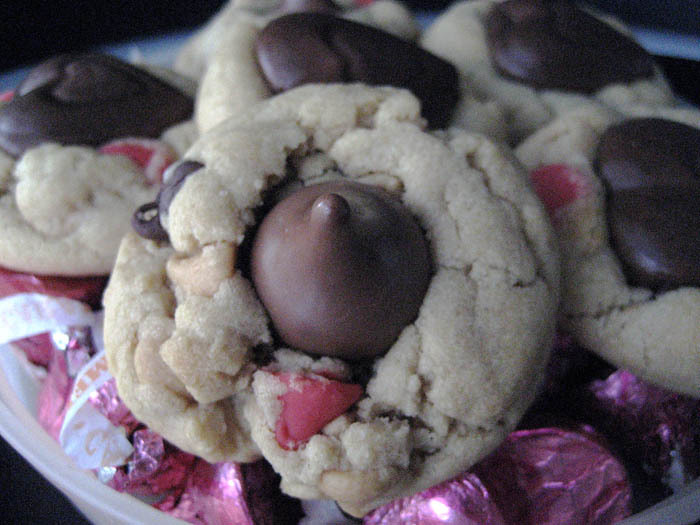 Thus, a mix of Reese’s Hearts and Hershey Caramel Kisses to use in the cookies seemed like the perfect combo (spoiler alert: I was right). These cookies are very similar to your basic peanut butter blossom cookie (which is always inferior to my peanut butter cup cookies, fyi). 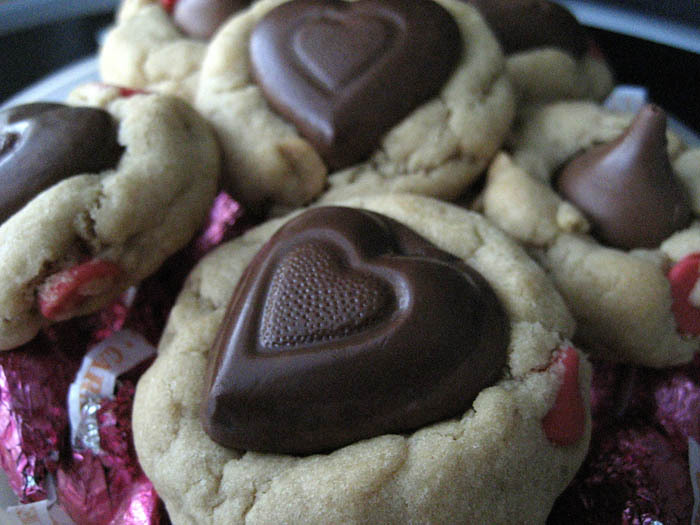 You bake up the peanut butter cookies and then smush a heart or kiss in the top while they’re still warm. If you’re using the hearts, I recommend freezing them first; they’ll hold their heart shape better after you press them into the warm cookies. 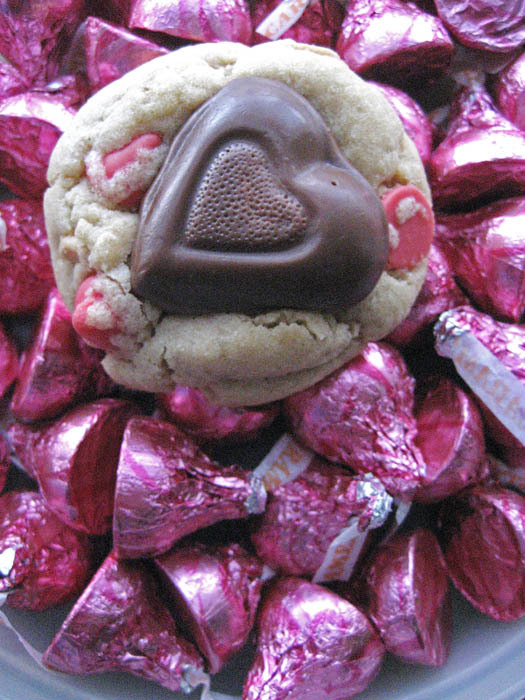 If you’re only using hearts, a single bag will be enough for the batch of cookies. If you’re using a mix of hearts and kisses, you will have some left over. Dang. On a sidenote, I feel the peanut butter to chocolate ratio in the Reese’s brand PB hearts is off. Too much chocolate, not enough peanut butter. The Domestic Rebel used Palmer’s peanut butter hearts, so perhaps they have a better ratio. I’m so glad we made nice. I promise I’ll have another Valentine’s post for you tomorrow. In the bowl of a stand mixer, beat together the butter, peanut butter and sugars until creamy. Add in the egg and vanilla and beat to combine. In another bowl, whisk together the flour, baking soda, cornstarch and salt. Add dry ingredients to stand mixer and beat until a soft dough comes together. Mix in peanut butter and chocolate chips. Cover dough in plastic wrap and chill for 30 min – 1 hour. Unwrap peanut butter heart candies and place in freezer. Preheat oven to 350 degrees F. Line baking sheets with silicone liners, parchment paper or mist lightly with cooking spray. Drop heaping tablespoonfuls of dough about 1-2″ apart on the baking sheets. Bake for approx. 8-10 minutes, rotating pans halfway through baking time, until set and golden. Remove from oven.